Voigtlander Bessa L or Leica A ? Voigtlander Bessa L or Modern Leica A? The 1925 Leica A established not only Leica, but what would become 35mm photography. The 1998 Cosina Voigtlander Bessa L (aka Cosina 107-SW), established today's Cosina Voigtlander rangefinder success story. IF you take a close look, the similarities are remarkable. What Do Yah Got? 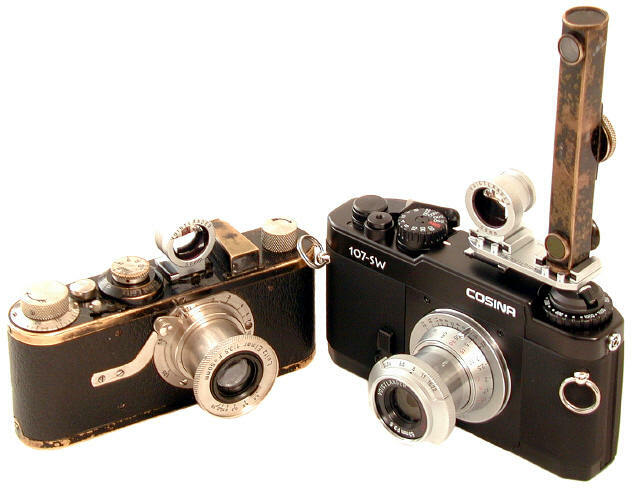 The Cosina Voigtlander Bessa L ! Leica A shown with Voigtlander 50mm Brightline Finder, fixed collapsible 50/3.5 Elmar lens. Cosina 107-SW (aka Voigtlander Bessa L) shown with interchangeable collapsible 50/3.5 Voigtlander Heliar lens, double accessory shoe, 50mm Brightline Finder, and 1925 Leica vertical Rangefinder. Revised: September 11, 2017 . Copyright © 2004-2007 Stephen Gandy. All rights reserved. This means you may NOT copy and re-use the text or the pictures in ANY other internet or printed publication of ANY kind. Information in this document is subject to change without notice. Other products and companies referred to herein are trademarks or registered trademarks of their respective companies or mark holders.